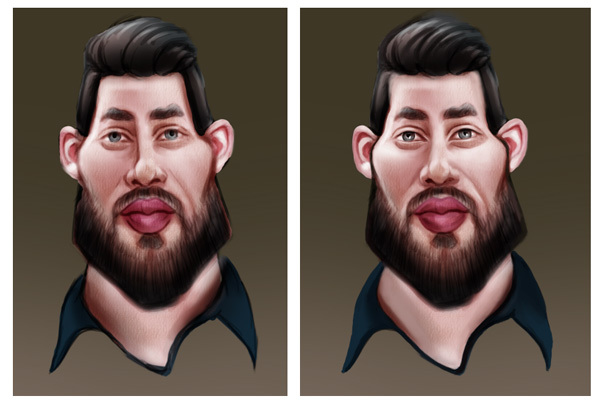 Caricature portraits are funny paintings that show people’s faces distorted while maintaining their likeness. 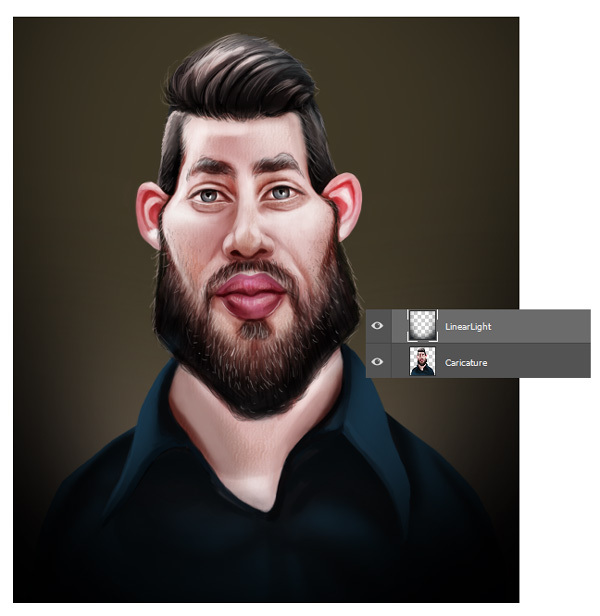 In this tutorial, learn how to paint a caricature portrait of your own using Adobe Photoshop and a Wacom Intuos Draw Tablet. Open a New Document in Adobe Photoshop at 1110×1270 pixels at 300 dpi. Keep the reference of the person you would like to draw nearby. Here I’ll be using this free reference as our subject. Analyze your subject closely and see which areas stand out the most. 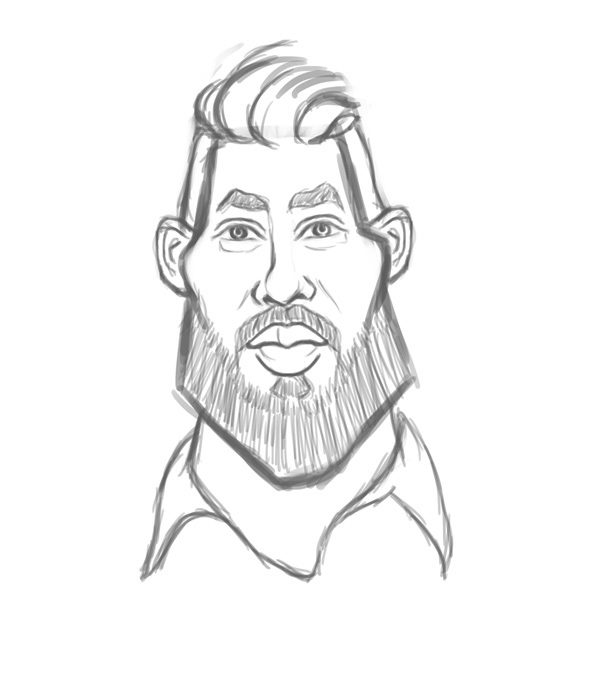 The key to drawing a caricature is to emphasize the features of the face that make the person who they are. In this case, the man’s large ears, lips, and jaw line can be exaggerated. Once you know which areas you would like to exaggerate, begin drawing your caricature. 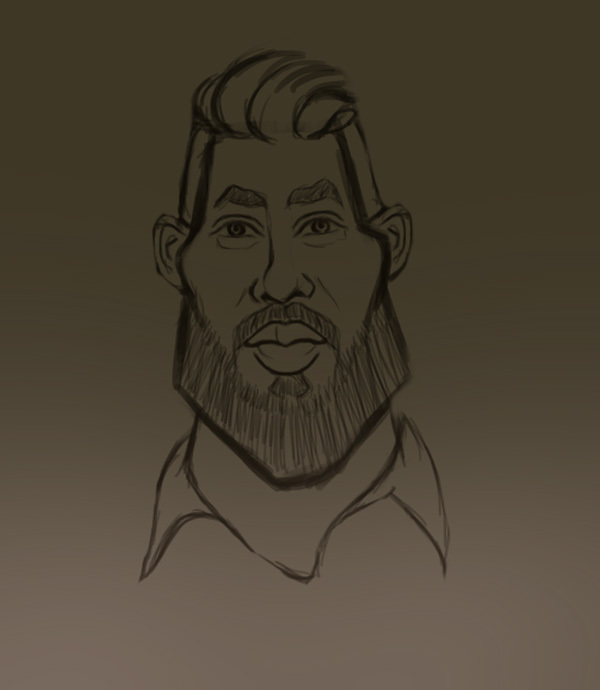 Create a New Layer above the white background and use a Hard Round Pressure Opacity Brush (B) to sketch your caricature. Make sure the option for Pressure for Opacity is selected. Create a New Layer underneath the sketch. Use the Gradient Tool (G) to fill the layer with a muted green (#3e3726) to a lighter green (#695d50) Linear Gradient. Then set the Layer Blend Mode of the sketch to Soft Light. You won’t see much of a difference here, but it’ll help for the next step. To start painting the caricature we need a base. 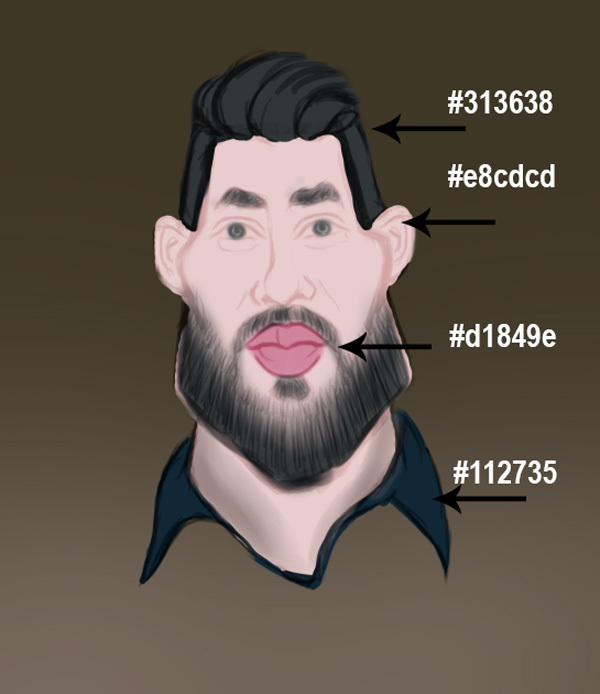 Create another New Layer named “Base” underneath the sketch and use a Hard Round Brush at 100% Hardness to paint the base colors for the face, hair, and shirt collar. Because the sketch layer is set to Soft Light, the sketch will blend nicely into the base colors. 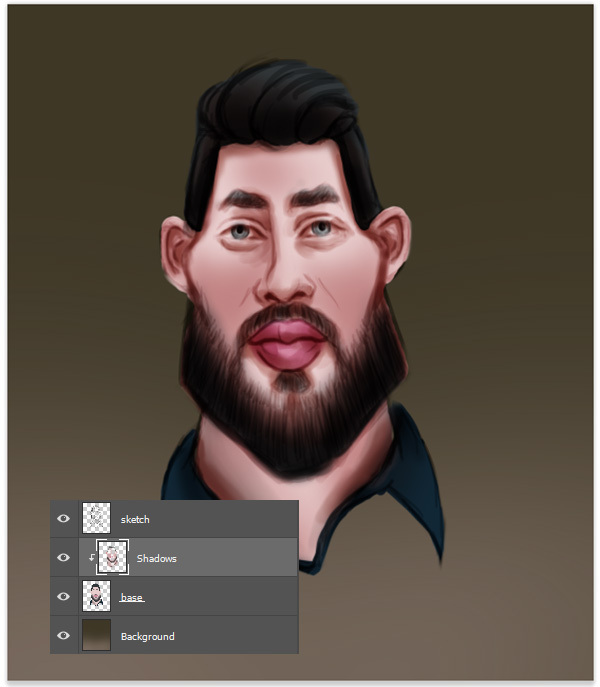 On the same layer, don’t forget to paint the base colors for the eyes, facial hair, and lips. You can find the codes for all the colors below. Create a New Layer above the base and set it as a Clipping Mask to the base. Name the layer Shadows and set the Blend Mode to Multiply. We’ll be using the Eyedropper Tool (I) to select colors to set as our Foreground Color, then use those colors already on the canvas to paint the first shadows for this portrait. 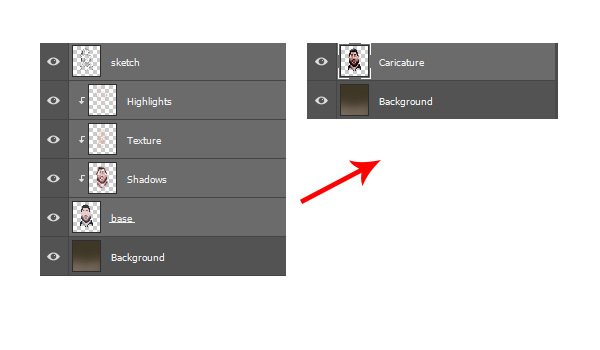 Create another New Layer clipped to the base and name it Texture. Set the Blend Mode to Multiply and use the Triangle Pastel Brush (B) to add brown realistic skin texture to the face and neck. Let’s start adding some highlights. Clip a New Layer named, Highlights, to the base. 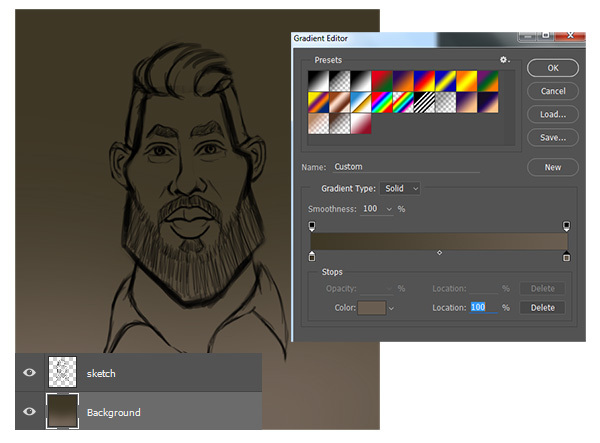 Set the Blend Mode to Linear Dodge (Add) and use the Eyedropper Tool (I) to pickup nearby colors to paint highlights. You should be studying your original reference this entire time that you paint. Concentrate the highlights towards the upper regions of the face. 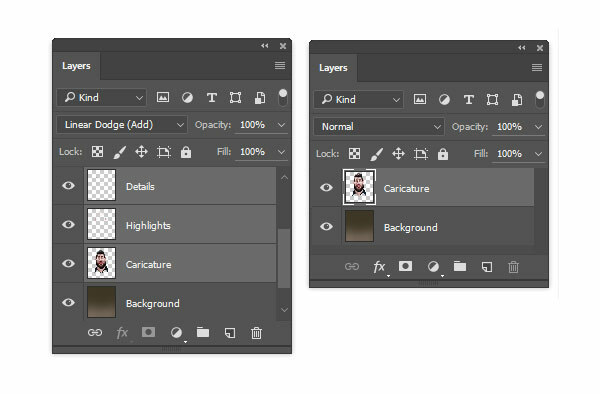 Now select all the layers for the sketch and face and Merge them together. 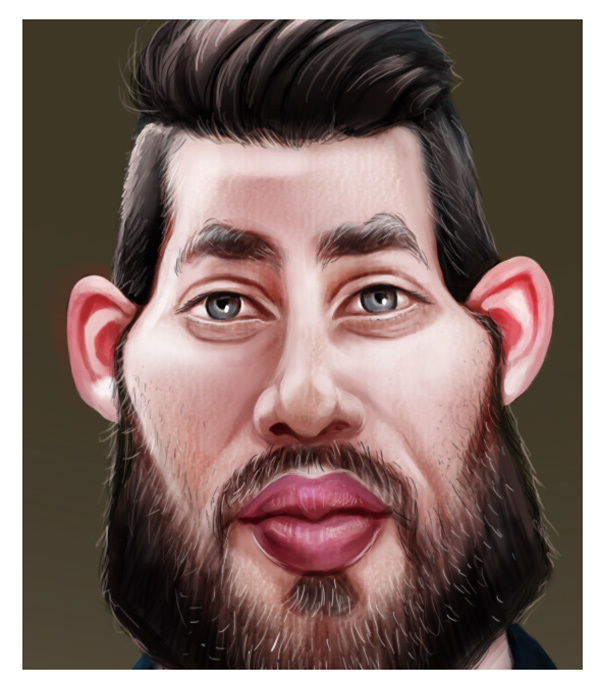 Name the new layer Caricature. It’s time to tidy up this painting and make it look cleaner. To do this, use the same Hard Round Pressure Opacity Brush from earlier to start cleaning up the texture in the face, hair, and collar. 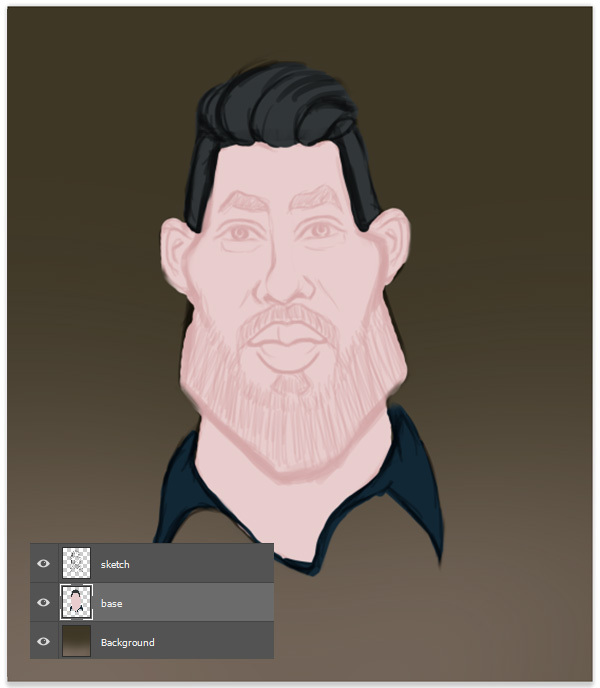 Paint all this on the Caricature layer, making sure to clean up the soft blurry edges with a crisper edge. 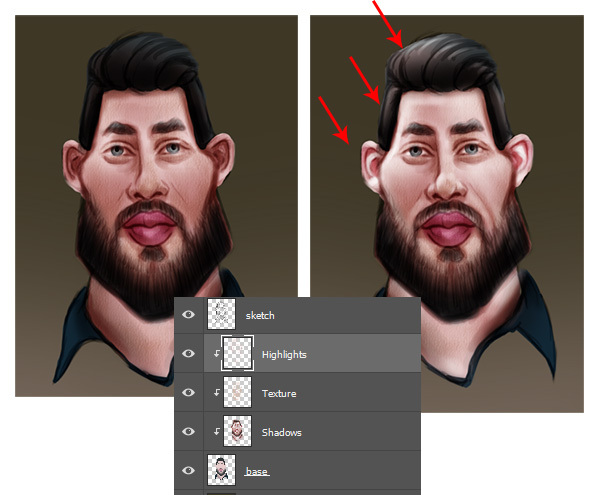 Create a New Layer above the Caricature layer and name it Highlights. Set the Blend Mode to Overlay and use white and bright warm colors to add more highlight onto the skin. Make the cheeks and ears a little rosier and the top of the forehead and hair brighter. We can’t forget the beard! To make this painting come alive we’ll need to paint tiny details where the light will be bouncing around. 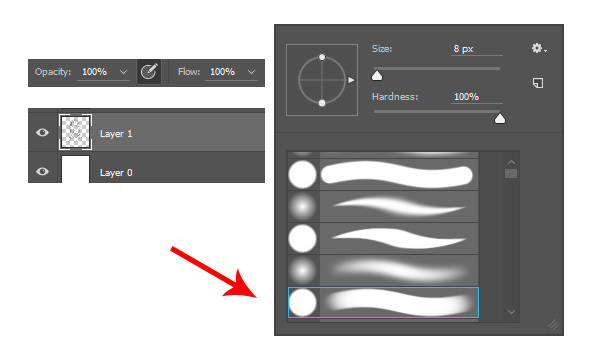 Start off by creating a New Layer set to Linear Dodge (Add) above the Highlights. Name this layer, Details and use the Eyedropper Tool (I) to select colors already on the canvas to paint highlights in that area. Paint the hair for the beard in all different directions. Draw swift tiny strokes to show light and movement. 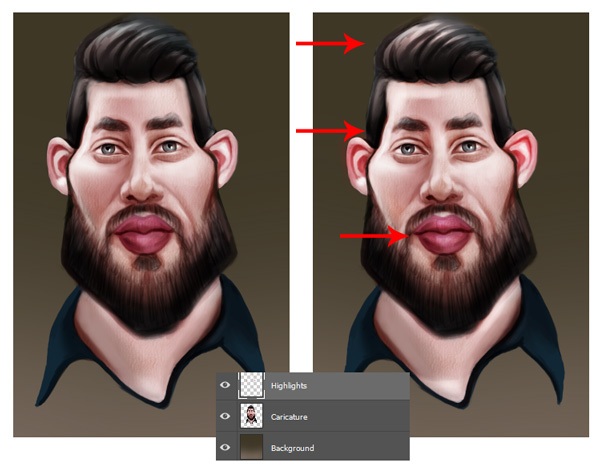 Merge all your caricature layers together except for the background to finish this painting on two separate layers. This will help with file size and performance. Continue painting details to add more personality to this portrait. 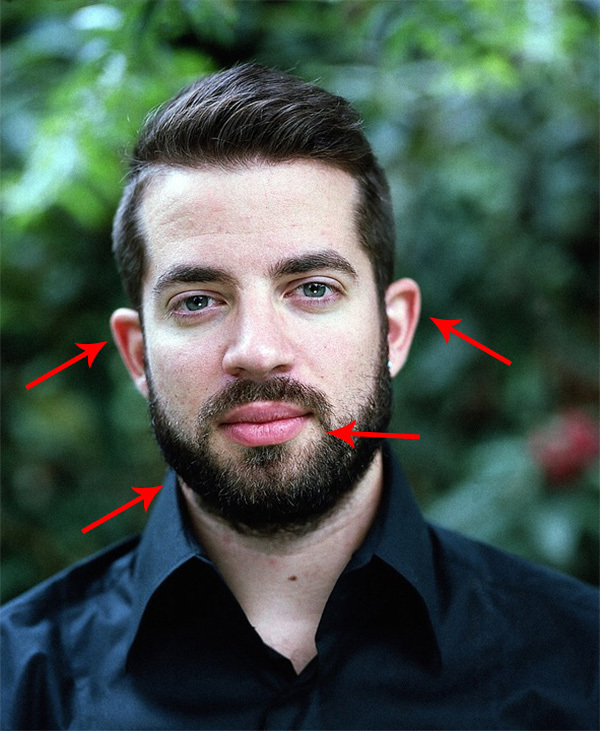 Add more tiny hairs around all the facial hair, including the mustache, beard, and eyebrows. 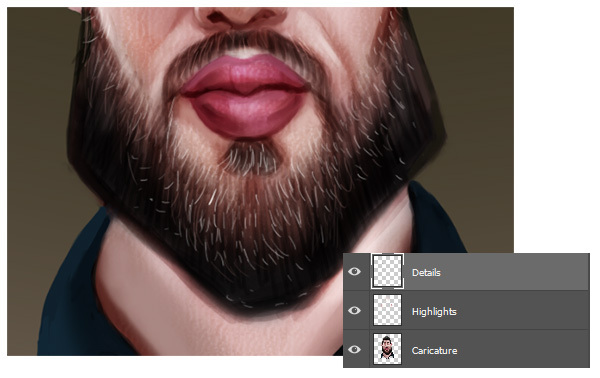 Paint white highlights around the lips, and clean up all the edges for a perfect portrait. If you feel your portrait could use a little more painting to it, consider adding onto the man’s outfit. Here I paint shoulders and part of his shirt. 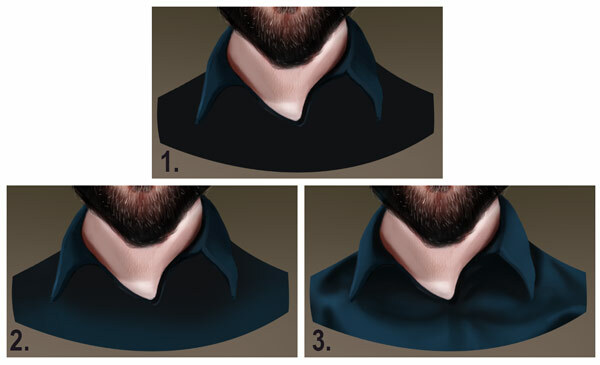 Start with a solid dark blue base, and then add the wrinkles of the shirt slowly with a Soft Round Brush. If you still need more length to the body, go to Filter > Liquify and use the Forward Warp Tool (W) to drag down the shirt and shoulders. 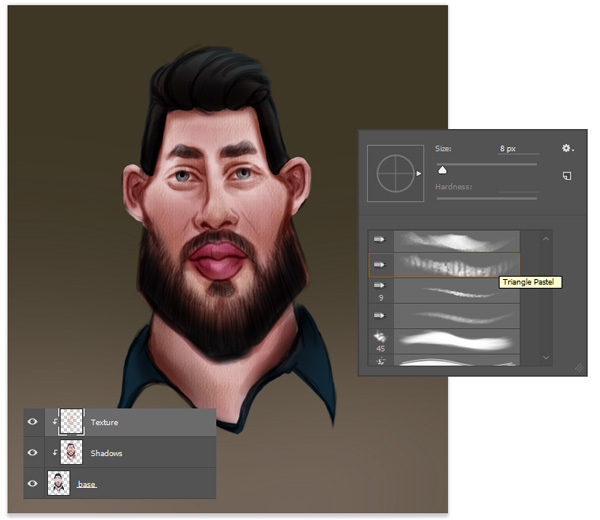 Create a New Layer above the caricature and set it to Linear Light. 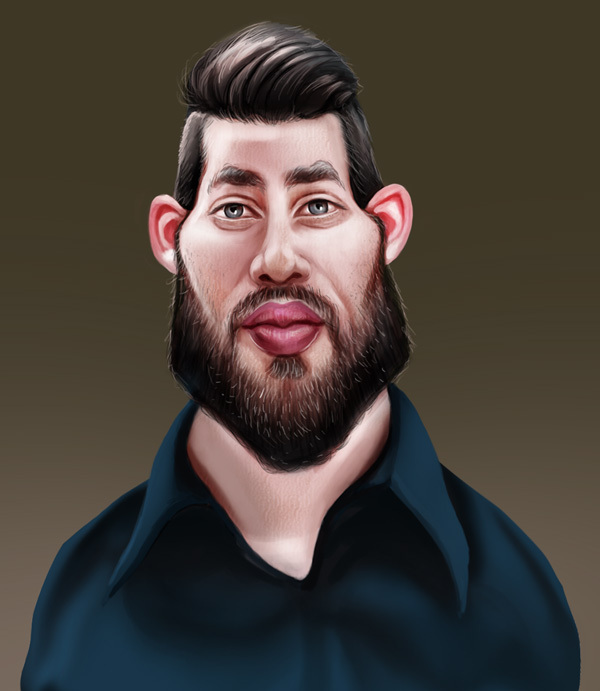 Use the same blue from the shirt, paint soft shadow on the bottom and sides of your portrait using a Soft Round Brush. Merge all the layers together. Here is the final painting. And that’s it! Digital paintings take a lot of practice but with time and determination you can create a fun caricature of your own! I hope you’ve enjoyed this tutorial, feel free to let us know your questions in the comments below. Good luck!